“Aikido is generally believed to represent circular movements. Contrary to such belief, however, Aikido in its true Ki form is a fierce art piercing straight through the centre of opposition. The nature of the art being such that you are not supposed to adapt yourself to your partner by making a wide oblique turn of your body but are called upon to find your way onward while twisting your hips. After performing Ki exercise the Founder once observed that: “I am what I am today precisely because I have been carrying on solid exercises for as long as 60 years”. There are many aikido masters, but only a few who had a lot of teaching from O’Sensei himself. In true budo, you do not express yourself in words or writing. “God does not give grace to those who talk too much.” This is what O’Sensei said. Usually people who talk a lot and write good essays cannot also do good aikido. It is better not to talk too much, but to learn with the body. Interview by Franziska Roller and Miles Kessler, May 1999. “There are often those who fancy themselves great by virtually knocking their partners down flat on the mat. Their concept of hard training is utterly wrong. The essence of real training lies in the throwing process. When let loose mercilessly, Aikido techniques do not allow Ukemi (defensive rolls and somersaults). AIKIDO Volume 5: Training works Wonders. 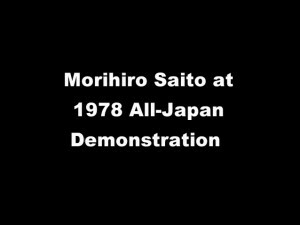 Pages 36, 41.
is graphically and superbly demonstrated by this video of Morihiro Saito Sensei performing at the 1978 All Japan Aikido demonstration with ukes, Shigemi Inagaki and Bruce Klickstein.